The Devs are on quiet flights home now, while the players they served are scattered all over the US and elsewhere. The naked tables, without their black cloths, remind you the party is over. And what a party it was. 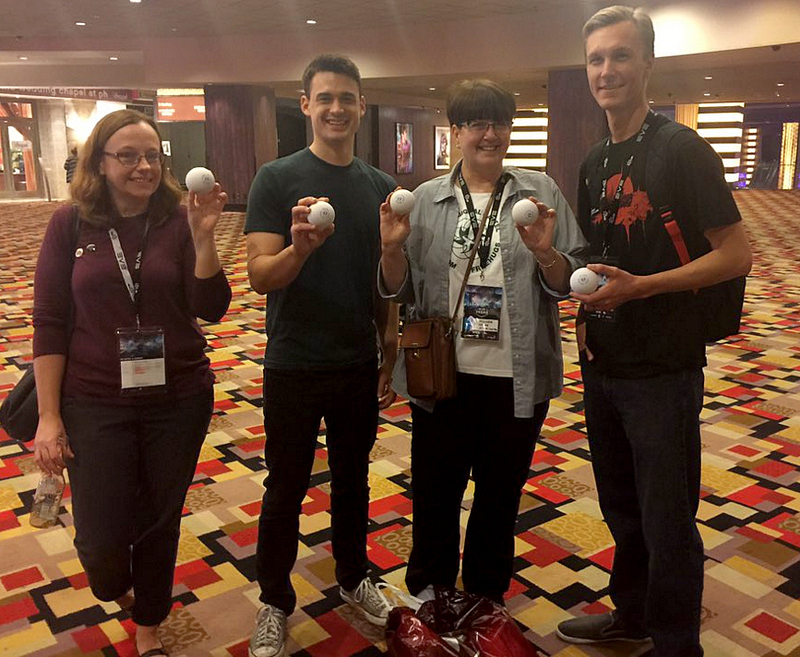 EVE Vegas had 764 players show up from all over the world, mostly from the US, for three official days of EVE fanfaring. 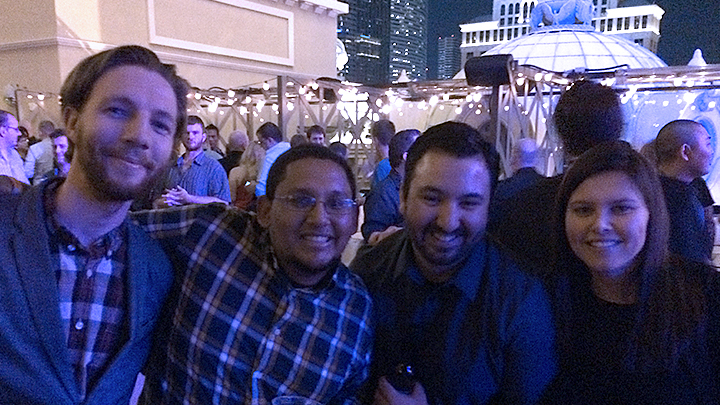 Here is a personal odyssey through the ups and downs of EVE Vegas, the closest thing to Fanfest outside of the true Reykjavikian one in the spring. Las Vegas has all the trappings of a future-city, with lights reaching deep into the sky, obscuring the fouled floors below. Keep your eyes up and walk fast. On the giant streets the lights are so bright they change night into day, but inside the buildings, the false skies above the walking malls are always at dusk or dawn. Casinos don’t want you to know the difference between night and day so that time disappears, along with your money. The convention hall was a long escalator’s trip up to a cavernous space with a small crowd milling around registration. The noisy gambling machines below were muffled. I pulled up and got in line behind a generous player that turned and offered me EVE game cards that he’s collected. “Take as many as you want.” he urged. Another guy had what looked like a Caldari cosplay outfit on, so I complimented him. He informed me that it was not a costume. Then Dirk MacGirk, a well-known podcaster, writer and personality, offered people in line a shot of Tito’s Vodka. I partook. Then Grath, a leading figure in Pandemic Legion, walked up with a few people in tow. Then The Mittani (Mittani) entered the line behind me. Grath and Mittani hugged it out, and Max Singularity (Space Pope) approached, out of costume. Mittani kneeled and kissed his ring as he did at fanfest. My iPhone wasn’t fast enough to capture it and someone warned him I was from EVENEWS24 (EN24). Mittani’s fast mind and intense manner were on full display. “Who are you?” Mittani asked. “Matterall,” I offered with a handshake. I laughed out loud at the speed and precision of the cutting remark. All at once, it makes you feel good about yourself and bad about who you work for. Without missing a beat, the next thought is the closer: Sion is his contract carrier. The reference was a signal that there was more business to be done, but not with him. He went back to talking to Grath. Any notion I had of Mittani being a wordy spokesperson for Sion’s agenda went out the window. Mittani is in charge, Sion is the quiet fixer that picks up the chairs his boss knocks over as he whirlwinds through a room. The compliment was a nice surprise. No one should forget that Mittani is a great writer. His “Sins of a Solar Spymaster” series for TenTonHammer were a reliably good read. If you get a chance look them up, there’s a lot of good history there from a direct source, written in a compelling way. He also writes great narratives for his troops at wartime: “..the StainRus are boiling out of their trenches.” Who writes like that?! I’ll take the compliment from a guy who’s a much better writer than I am, but I reject the idea I’m the only one. I heard that The Mittani gave Mynxee a big hug when he met her, showing proper respect, so he can’t be all bad. I delayed finding a seat for the keynote, so I sat in the last row. As I stumbled to my chair in the dark, so did the CCP Punkturis, Rise and Ocra. We met in the middle with Punkturis in the seat next to mine. CCP Karkur arrived a moment later, so I gave her my seat and moved over one. Punkturis teased that I moved because I was afraid of being surrounded by girls. I reminded her that I was a reporter and if I sat between them I would eavesdrop and know what CCP was thinking. Karkur countered, “Not if we speak in Icelandic.” Good point. In the middle of the keynote, there was a loud thud behind us. A large Foster’s beer had fallen and burst open, fizzing into a puddle. Of the 20 to 30 guys standing back there, no one moved. A very tall and large man was leaning face first into a pillar. The fallen beer soaked into his shoes. CCP Rise (former famed pvper Kil2) leaped over his chair and tapped the big man’s shoulder to see if he was okay. Rise (Kil2) walked him all the way back to his room, but, like a puppy, the big man followed Rise all the way back and passed out in the back of the hall. Player presenters were asked to meet Saturday morning. Andrew Groen showed us all his book, “Empires of EVE.” He was as excited as we were. There wasn’t an ounce of cynicism about all the work that went into it. He was especially excited about the war maps and the endpaper (inside-front cover) stellar map that was made to look like an old navigator’s map. The quality of the book is on par with anything CCP has put out. This is the true companion to the “EVE Source” book. Get it when it comes out, which will be soon. Devs are like flowers to a colony of player-bees during pollination season. There was always someone landing on them, yet they never closed up or shut anyone out. Players naturally gravitated to Devs because they have an “in” with them: Talk about EVE. It’s natural to gravitate toward a Dev when you are in a room full of strangers, but you have to wonder how much Devs endure the repetition. 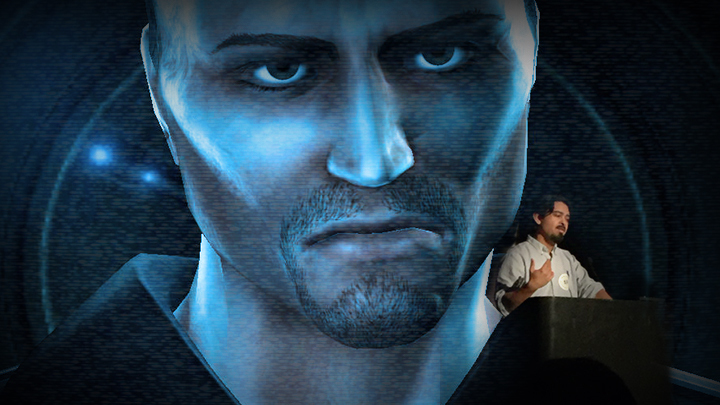 Magically, when Devs change out of the official black CCP shirts, they become human again, and the EVE talk goes away. We must have been talking EVE to the CCP shirt, not to the person. Maybe they can see that as well. Devs are people, too, and distinct from each other, even in their approach to their job. CCP Rise was tuned way into to EVE, and way out of meta politics. Nullarbor has the listening capacity of a Christ-figure, willing to discuss mechanics as the cleaning crew is sweeping up. Falcon is edgy, but true to his appearance (purple Mohawk), which is perfect, because even as a player he represented old EVE: a barrel-to-your-head pirate that honors his ransoms. I asked Falcon about his days as leader of Veto (notorious pirate corp), since ransoms seem to be out of style. He said they always honored their ransoms and only once did a member test him on that. That member was executed, stripped of his wealth (billions, when that meant something) and cast out. Falcon was never tested on honorable ransoms again. My personal highlight was spending time with Mynxee, who called me over as if I was a puppy, and as it turns out, I was about as happy as a puppy when I found out who she was. She gave me a Signal Cartel sticker, which I immediately put on my chest, minutes before I stepped up to present. Resting after presentation. CCP Nullarbor is on stage. He makes it look too easy. In my preconceived visions of how the presentation would go, I pictured the portrait of Istvaan Shogaatsu of Guiding Hand Social Club (GHSC) getting a strong response. That didn’t happen because very few recognized the old portrait and some didn’t even know who the GHSC were. A reminder that not everyone has the same reference points in EVE as I do. EVE history is generational, and that means I have plenty of stories to tell to new audiences. Mynxee caught me on the way out and generously invited me to dinner with her group. She was the fifth CSM’s chairperson and is now, since spring, out from under NDA. I had a million questions, but she didn’t divulge anything worth reporting; however, the guy next to her seemed to know way more about the CCP than the usual EVE player. At the end of dinner he introduced himself as Nozy Gamer, the blogger that even CCP reads. Nice man, good writer and incredible researcher. Dunk Dinkle (from Brave) approached me and handed me a Brave patch, saying, “Someday I’ll tell you what really happened.” Which, to a journalist, is like a slap in the face with a white glove. Except I’m a pretend journalist, so that would be a pretend slap with a pretend glove. No offense taken. “I don’t like that story, man,” he said with a big smile and handshake. “It was Lquid and Anna (diplomats) that did the coup. Toasty (Illuminati) had little to do with it,” he said. I also had Lychton (ex-Brave leader) review the whole story to remove any inaccuracies before it was published. Nancy hurried off, not because he didn’t want to argue, but becasue he noticed Mangala Solaris (leader of RvB) in the crowd and wanted to get over to him. RvB had just ceased operations. That meant a great recruiting opportunity for Brave leaders. That’s what a good Executor does, holds his alliance together and builds them up. One of the Brave members that stayed behind told me they were a little down because fleets were only 20 to 30 pilots. Even for a 2,000 person alliance, which Brave now is, those numbers are too low. I told them EN24 could help by publishing more battle reports from Faction War now that Brave is fighting there. Visibility helps recruitment, and any news site can offer some help in that area. The party was attended by 645 EVE players that mixed together to create numerous little scenes. It was a people-watchers paradise, but while I was scanning all the faces, some of them were scanning me. The paranoia of my presentation didn’t help. I knew Dunk Dinkle had been handing Brave pocket knives all day. As the night wore on, some of those faces approached me and they could not have been friendlier. I got hugs, pats on the back, introductions to their friends and drinks handed to me. There’s nothing better than creating something original that connects with someone else. Everyone should feel that at least once in their life. The Devs must feel that every time they appear at a player gathering. By the end of the last day, the place was winding down, but I was still around waiting out the clock. Las Vegas to Los Angeles traffic on Sunday night is brutal, and I wanted no part of it. As the conference pond got smaller the CCP fish became easier to trap. There was Executive Producer CCP Seagull, who was always on the move, now floating around the room with less urgency than before. Her demeanor comes from the same well as her egoless approach to EVE. She approaches people cautiously and warmly smiles past her thin glasses, bestowing the feeling that she’s just put something special in your coat pocket before she floats away again. So standing there with my laptop bag, Seagull fell into my extended personal space while holding decals (stickers). I glanced at them and she smiled and peeled off a Caldari sticker, so I grabbed my iPad and offered it to her. She placed the sticker on the iPad and smiled again. I don’t think any words were exchanged, but the communication couldn’t have been clearer: CCP loves their player base. It was just another small act of kindness, but it capped the whole experience for me, and now I could leave on a high note. As I made my way out, there in front of me was Mittani talking with Kira Tsukimoto and Dirk MacGirk, two people I knew as well. I had one last chance to ask him about something he said in an interview about the responsibilities of leadership, and I was feeling good. It was a genuine question from one person to another, but in this environment he wasn’t just another guy, he was TheMittani.com (TMC) and I was EVENEWS24.com (EN24). We were rivals. So he dressed me down for several minutes. Kira slinked away, so did Dirk. I understood the mistake right away, but I figured at some point he’d relent and I could explain that it was more of a personal question. He didn’t relent. Mittani is relentless, if nothing else. That is evidenced by his ingame accomplishments and position today as the eminent personality in EVE, above even Chribba. At that moment I had plenty of time to think since I wasn’t able to say much. I saw flashes of good and evil, with Chribba, the old school “most helpful” bro dressed in white, contrasting with Mittani, dressed in a dark suit over his signature deep red shirt, cutting me to pieces with his laser-beam eyes. His hand gestures alternated between stabbing and dismissive. “Are these the angels and devils of EVE?” I thought. It did, after all, feel like I was being impaled by Mittani’s words about EN24, aimed, in particular, at its founder Riverini. The thing of it is I didn’t disagree with Mittani. I know Riverini’s capable of making terrible choices, and I disagree without about 90 percent of what he says and does, but Riv doesn’t say much and is never around. His EN24 is long gone. Bobmon runs the show now and even he is not around all that much (he’s running for CSM, by the way). His job is to pull in sponsorships and pay the staff, and he does that without fail. EN24 is really run by senior writers like Amymuffmuff or Tiberius, with Bobmon stepping in when needed. So if there is a good change in EN24, those are the guys to thank. I waited for a chance to say that, but it never materialized. The Mittani was done talking and moved on to finish other conversations before he disappeared. Meeting the Mittani on a human level was an abject failure, and I knew better. I worked in feature-film production for 10 years before becoming an art director for the film industry, and in that time I’d been a second-assistant director. That position is tasked with moving actors around and getting them to the set on time. I knew better than to try to get to know them at the wrong time, and this reminded me of those days. After talking with one last Dev it was time to face traffic. I walked out to the cavernous mezzanine and was happy to see Mittani walking in my direction, alone. At least I could end with a hand shake. He could have waved me off but he stopped and we talked again. Actually he talked again, picking up where he left off. It didn’t help that I was in Nulli and NC, too. That gave him a whole set of new territory to cover, stretching all the way back to the great wars (buy Andrew’s book to find out more). It struck me that he wasn’t showboating earlier, that rant was him. As passionate about defending his Goons as Bono is feeding the hungry, but this time I did interject that I didn’t represent Riverini, and if anything I worked for Bobmon, who he seems to be okay with. So there it was, we talked a while there in a giant vacant space, our voices echoing off the walls. We weren’t equals and this wasn’t an interview. The Mittani not only runs the largest coalition in the game, but runs a thriving business that is timed perfectly. Streaming and gaming content is hot right now and will get hotter as gaming enters 3-D. He uniquely has leveraged power and wealth out of the EVE where so many RMTers and gambling sites failed, because they foolishly focused on changing ISK for money, instead of people for influence. His company is now partnering with CCP to write books and they streamed EVE Vegas for free. TheMittani.com is fused to his personhood, his celebrity. So as the brand grows, so does the pressure on this one person. No one else can take his place. He’s trapped in that red shirt. My original question to him was about the burden of leadership, and he’s uniquely positioned to answer it on multiple levels. Instead of answering it, he offered to show me the perks and we set off for the TMC suite high up in the hotel tower. The TMC crew was finishing interviews so we walked through to the second room to talk in private on many subjects, none having to do with EVE. After about 30 minutes, Sion retuned and was surprised to see me there. They had finished up filming so we joined them out there. I finally met Markonius (leader of Karma Fleet), who was a nice guy as expected. So there I sat, an EN24 reporter from NC, in the middle of the inner sanctum of the Imperium: their infamous party room from the night before that hosted a who’s-who of EVE. Watching the TMC guys gear down equipment and gear up for a night out with their chief, Mittani. Or as I saw it, David sitting in a room with Mark1 and Mark2, while Alex made arrangements to take his guys out for the night after a ton of work on behalf of EVE players. Meta EVE is indeed a strange place. I’ve never been more convinced that it is the real game, and the spaceships are the window dressing. At home the next morning I woke up with a sleep deprivation hang over. I may not drink much but I burn a good amount of midnight oil. Reflections on the trip are still vague glimpses of moments that quickly roll out of reach, like water hitting saturated soil. I’m not even sure that it all happened, but it felt real. PS – I met a lot of people and didn’t get names but thanks to everyone that made EVE Vegas fun and interesting.To the people I spent the most time with, that’s all personal and stays with me. You know who you are. Thanks for hanging out. Sion and The Mittani for giving me as much time as they did. Laz and Markonius are very cool bros if you get a chance to meet them, do it. TMC guys deserve thanks for stepping in and streaming. Shadow and Light, J Mcclain (Best of Us channel) and EOC.VT for putting up cameras in 4 hours and covering everything. Johnny Splunk (Signal Cartel), Zoe Schereau and the others at Signal Cartel. Nice group. Kira, Bam Stoker and all the people from far away taht made the long trip. WOw. I maintain a number of blogs & discussion forums as well as enable individuals to compose their discuss them. I inspect frequently as well as remove any type of swear words, etc. I additionally ask commentors not to leave any kind of negative terms on the blogs/forums. However, that claimed, am i still legally responsible for the web content on my blog/forums if they create a defamatory remark or violent remarks?. Lots of thanks. 2fhMrr I think other web site proprietors should take this website as an model, very clean and magnificent user friendly style and design, as well as the content. You are an expert in this topic! I’m searching for blog sites that have really terrific advice on what remains in fashion and what the very best make-up is. Just want to share something. I require to submit my blogs to blog sites with many people reading blogs. That’s what I require many.